The modified Cat 320D L in SkyFall. The cabin was put on the opposite side of the 320D L, as requested by EON Productions. The modified Cat 320D L on the set of SkyFall. In the action-packed opening sequences of SkyFall (2012), James Bond, played by Daniel Craig, operates a Caterpillar 320D L hydraulic excavator. The British Secret Service agent does it on a train that’s barreling down the tracks through the Turkish countryside. Other Caterpillar machinery on the train include a Cat power generator and a Cat 216B Steer Loader (both can be seen right after Bond jumps on the train). The Cat and Caterpillar logos are so frequently seen in the action scene that it almost could be called the most prominent product placement of SkyFall. Planning for the excavator's participation in SkyFall began in July 2011. Art director James Foster, who collaborated on the early plans for the scene, said "We originally had three ideas for this stunt during the opening scene, including using the 320D L somehow on a flatbed train carriage. It was the idea that leapt out at us as a cool thing to do and we liked the idea that the excavator's boom is Bond's arm reaching out to grab the train." The stunt took extensive coordinating and planning. "We had a rehearsal period of about four months and then another two months shooting the scene," says Martin Joy, the location manager in Turkey. Adding to the challenge was the fact that this kind of stunt had never been attempted before. Gary Powell, the stunt coordinator for SkyFall, said, "There were a lot of unknowns so we started with simple studio testing. When we eventually arrived in Turkey, we made test runs of the train's entire route to check for hazards such as low cables." When filming did begin, it took a crew of about 300 people to complete the shoot. The crew chose Adana because railways there went through the right kind of landscape. Plus, one of the five tracks had the kind of bridge needed for the end of the scene. Not all filming was done in the countryside, however. "At times, the set was two kilometres long and went right through town," Martin Joy added. The Cat 320D L was modified to fit the requirements of the film. The customisation involved something unique – putting the cab on the opposite side of the 320D L as requested by EON Productions. Darren Litten, action vehicles coordinator, explains, "Because of pre-visualizations, the location and interaction between Bond and Eve, it only worked if the cab was on the other side." Changing all the electronics and hydraulics was a huge task for the special effects department. "Probably 50 percent of the work done to that machine was changing the cab around," said Litten. "The cab switch, required for the location of the shoot and interaction between characters, took several months of pre-planning," said Robert Woodley, Caterpillar Communications Manager for Europe, Africa, Middle East and the CIS. "The biggest challenge involved changing the electronics and hydraulics to accommodate the cab on the other side of the machine. Ultimately, two 320D L excavators were produced in Caterpillar’s Akashi, Japan, plant for SkyFall. Cat dealers Finning UK and Borusan Makina were in on the action, too. Finning UK assisted the special effects (SFX) department in technical support and supply of parts for the excavators. At the site, Borusan Makina provided on-site expertise and services as well as equipment, such as generator sets, a skid steer loader and mini hydraulic excavator, for the shoot." A lot of time and effort also went into making sure actors, stunt people, crew and bystanders were safe. For example, the excavator was held to the train using a metal track so the 26-ton machine could travel along the length of the rail car and not fall off. "Safety was critical," says Chris Corbould, special effects supervisor. "We were basically shooting through the middle of Adana, Turkey and had the added danger of a high-speed car chase that takes place next to the train." For the 320D L, some creative "set dressing" was used to make the stunts as safe as possible. James Foster said, "We discretely added hand holds and used grills to cover some of the hydraulics. We also used a grippy paint finish on certain areas of the 320D L so there was extra traction." Caterpillar had made a mini-website for the Cat in SkyFall: www.catskyfall.com featuring trailers and behind-the-scenes photos, but that website is unfortunately not online anymore. This is not the first time a Cat is featured in a Bond film. In The World Is Not Enough several Cat vehicles can be seen and Caterpillar was mentioned in the end credits. In Casino Royale (2006), Bond also chases the villain in heavy equipment, but instead of a Caterpillar he uses a New Holland Wheelloader W190. 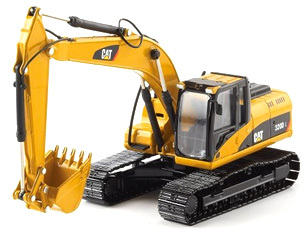 If the real thing doesn't fit in your garden, get a Scale Model of the Cat 320D L in scales 1:87 or 1:50 on Amazon or eBay.